The brainchild of the “Dr. of Grillology”, Ken Foster, and brought to life by Gary Webb, the X-Grill began its life as an oil delivery truck for Hall Oil and the Oil Peddler on Cape Cod. It was modified into a mobile barbecue grill truck with the best BBQ toys in the business. Breakaway knew it had something special when it was featured on The Travel Channel’s “Grills Gone Wilder”. 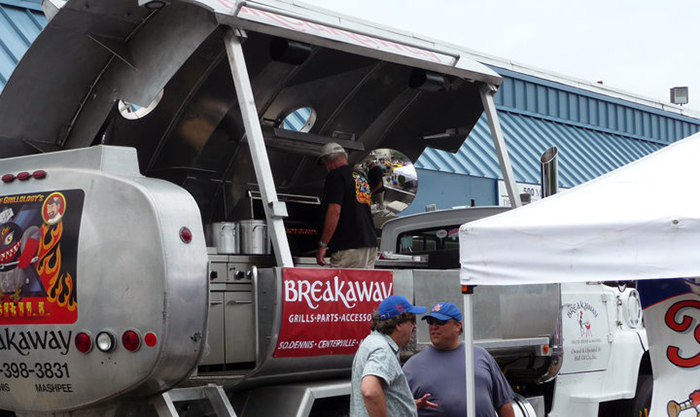 This 16,000 lb rolling BBQ dream machine of a grill truck is primarily used for community events, fundraisers, charities, and other public festivals around Cape Cod. The X-Grill rarely gets used for private events. If you need a grill rental for a private party, please see our LazyMan grill rental options. Want to see the X-Grill in action? Follow us on Facebook to see where this extreme charity grill truck goes next!